A quantum leap past positive thinking, GO! guides you to specific conscious, constructive ACTION. Discover Green Light, a new landmark tool -a global language, a mind technology. Marilyn Schoeman, author, inventor, international speaker and business/creativity consultant, equips you to make Green Light choices and actions, for more ideal outcomes. The Green Light Goal: Aim for the greatest good, in the best way, for the most people, for the longest time. 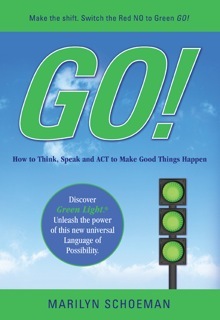 Green Light, the Language of Possibility, reveals new opportunities. It diminishes and disempowers negativity – Red Light behaviors. Use the words, ask the questions that avoid Red Light responses. GO! for Green Light ones. Use the Green Light Scale to determine where you are and where you want to be. Nine core principles and related strategies help you arrive there. A mindset, a skill set, a way of being, Green Light is universally useful, personally and professionally enriching. Attain extraordinary results and gain Go-mentum.